This guest post is by Jackie Gillard, an adoptive parent and blogger. 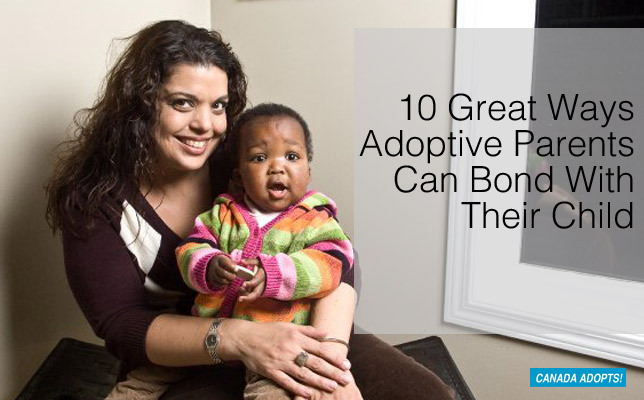 Like many new parents via adoption, attachment was our highest priority when we adopted our daughter. I read many adoption books and spent my days with her using as many suggestions to foster attachment as I could find. It’s important to keep in mind that not every child – or parent – will respond the same way to attachment ideas and activities. It’s best to try a variety of exercises to find the ones that fit your child’s age, temperament and needs. 1. Wear or hold your child. Facing you is best, with skin-to-skin contact, if possible. I used a carrier, and while at home, I would put it on inside one of my husband’s big shirts with my daughter also shirtless, so our skin was in contact. My daughter to this day still asks for “belly hugs”! 2. Only Mom or Dad should meet basic needs! Parents should be the only ones feeding, changing, or giving affection and comfort for at least the first three months. Bio-babies “learn” who their parents are and what family is by their mother and father constantly meeting their needs on demand. So it stands to reason that your child will also learn in the same manner. 3. Eye contact is a HUGE factor! Try to do everything and anything you can to have as much eye contact as possible, without forcing your child to do so. Feed your child (if he will allow you to) and give milk in a bottle while holding your child in your left arm and gazing lovingly into his face, even if your child has not drank from a bottle for a long time. Don’t be shy to ask even a school-aged child to snuggle in your arms like a baby for a bottle. His response may surprise you, as developmental age doesn’t always reflect calendar age. As your child drinks from the bottle, kiss the bottom of the bottle or put your face near it so he looks into your eyes as you do so. Sit to the right of your child while eating and feeding to encourage left eye-to-left eye contact, which has scientific roots in brain stimulation for attachment. Take turns feeding each other, if your child is old enough. Cup your child’s cheek gently with your hand and encourage her to do the same while you smile. This is still one of my daughter’s favourite gestures of affection and almost better than hugs because you can look at one another! A great game for encouraging eye contact is to sit facing each other, holding hands and singing “Row, Row, Row Your Boat” while rocking forward and backward. If one of you breaks eye contact, immediately stop singing and freeze! My daughter asked to play this game often without realizing we were building up how long she would maintain eye contact. For older kids, using a large mirror to look at each other and making funny faces together can be less intimidating than staring into one another’s eyes. You can work your way up to being each other’s mirrors and facing one another, copying what the other person does with their facial expressions. Nose kisses with open eyes and saying things like “I’m so glad we adopted you” or “We are so happy that you have joined our family” while doing so works for all ages. Use a blanket or towel to cover and uncover your face. Even with older kids you can explain “Now you see me, now you don’t, but I’m still thinking of you and now I’m coming back for you” when you remove the blanket. Hide and seek for older kids also helps their minds understand that you are still there for them, even if they can’t see you. 5. Have fun with a Slinky toy. Have her go around a corner of a room or wall so that she cannot see you and say that even though you can’t see one another, you are still connected and that is what “family” means. 6. Make sure your child has a family photo. Have a picture of you and other family members positioned in your child’s room somewhere that he can look at it while falling asleep and as soon as he wakes up. Some parents even affix one to the ceiling. Laminate a family photo with him included and let him hold it often, especially if you are apart. Some parents may feel the best way to bond is to pretend a child was always a part of their family, but acknowledging a child’s pre-adoptive experiences demonstrates empathy and honesty, which is important in building a strong connection. We usually said once a day during a happy moment “We are so glad we adopted you and that you are a part of our family!” so our daughter got used to hearing the words “adoption” and “family” even before she knew their meanings. I often would tell her a bedtime story using her and our adoption journey as the plot. I touched briefly on her life prior to adoption, acknowledged her hardships in age-appropriate general terms, and was careful not to make adoption day the happy ending. I mentioned her birthmother each time and acknowledged it must be hard for “the girl in the story” to be apart from her birth family and that she thinks of them often. 8. Model family behaviours during play time. Use sets of family dolls that resemble your family and your adopted child to create play scenarios to model for your child what family members do – hug, kiss, help one another, talk about feelings, go to work and school and then reunite after separations. This may require buying two sets of families if you’ve adopted interracially, but the rest of the family dolls that represents your child’s culture or race can also be used to symbolize your child’s birth family. 9. Create a “Family Circle”. Use painter tape, a long ribbon or string to create a circle on the floor large enough for you and your child to sit in together with some space for play (larger for crawling babies or toddlers). Explain to your child that you are in the Family Circle together. The circle can be expanded to include all members of the family for a game or play, or small enough for the two of you to cuddle or read a book. 10. Never let your child “cry it out” at bedtime. Sleep arrangements are a personal choice – many families co-sleep, many don’t. The only advice I give to all parents is to never allow your child to “cry it out” alone, and never leave your child with a caregiver after she has fallen asleep unless your child knows that you may not be there if she wakes up. When we brought our daughter home, we set up a twin bed in her room and took turns sleeping there for approximately six weeks after we brought her home, gradually removing our presence from her room in stages. We used a baby monitor so we could go to her immediately if she woke up. Our primary goal was to give the security of knowing that we were there for our daughter if she needed us, which is really what attachment is all about.